City Ballet alumna, Matisse D’Aloisio has just been hired by Sacramento Ballet!! Matisse began dancing at City Ballet in 2005, quite literally growing up at the school. During her time here, Matisse has danced almost every role in The Nutcracker, from an Angel to the Sugar Plum Fairy✨. In addition, she performed many lead roles including "Odette" in Swan Lake, title roles in Paquita and Raymonda, and the principal role in Esmeralda Pas de Fleurs. In 2016, Matisse was awarded first place 🥇 in the Senior Classical Division for Women in the YAGP San Francisco Regional Semi-Finals, as well as first place 🥇 in the Pas de Deux Ensemble Category. We will miss you, Matisse! Congratulations to Makena Malonso (Pre-Professional Division) for winning 1st place at YAGP San Francisco regionals, Senior Classical Division. And congratulations to Galina Alexandrova, City Ballet’s Artistic Director and Makena’s teacher! Great job Makena, we are very proud of you! 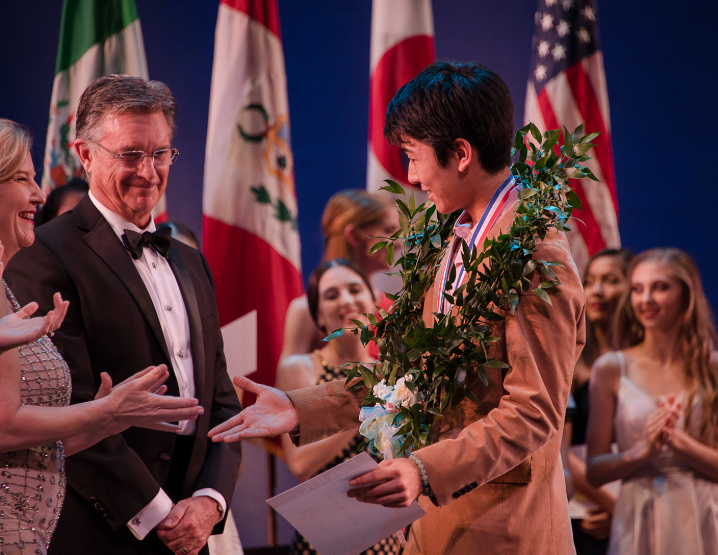 Congratulations to our very own, Hyuma Kiyosawa, for winning the Junior Male Division at the USA International Ballet Competition in Jackson, Mississippi!!! Click here to see an article written about Hyuma in The Japan Times! City Ballet School students (Levels 5, 6, and the Pre-Professional Division) got the opportunity to train for one week at the legendary Bolshoi Ballet Academy in Moscow, Russia - where their own teacher and Artistic Director, Galina Alexandrova, trained before going on to dance in the Bolshoi Ballet company. They also observed the Russian students in action. Besides training at the Bolshoi Ballet Academy, City Ballet School students got to take in the Russian culture while exploring the city of Moscow! Just a 10 minute walk from their hotel, Red Square was full of wonder and excitement as the Maslenitsa festival was well underway! Also close by, they saw the Bolshoi Ballet perform Yuri Possokhov's "A Hero of Our Time" and the classic "Ivan the Terrible", and saw the Kremlin Ballet Theatre perform "Swan Lake". Some of their other adventures included taking the subway everyday, sightseeing via a guided bus tour, shopping on Arbat St., and eating traditional Russian food! Thanks again to everyone who participated and made this trip possible! We are incredibly proud to announce that we will be taking a group of students to study for one week in February at the Bolshoi Ballet Academy in Moscow, Russia - for the third time!!! Artistic Director of City Ballet School, Galina Alexandrova (pictured), received her training at the Bolshoi Ballet Academy and went on to dance in the Bolshoi Ballet company before moving to San Francisco. Now, she is able to share a taste of this unique experience with her students. Our top three levels will not only take classes at the Bolshoi Ballet Academy, but will also see shows, be exposed to Russian culture, and most importantly get an understanding of where their own training comes from. Russia here we come! Congratulations to City Ballet Alumna, Matisse D'Aloisio, who has just signed a contract with Atlanta Ballet II for the 2017/18 season! Matisse has trained at City Ballet School since the age of six. It is because of her dedication, hard work, and natural talent that she has been cast in solo roles such as Sugar Plum in The Nutcracker, Peasant Variation in Giselle, Fairy from Sleeping Beauty, and the title role in Raymonda. We are so proud of you, Matisse! Congratulations to City Ballet's pre-professional student, Diego Altamirano, on receiving the silver medal in the professional division at the World Ballet Competition in Orlando, FL this past week. Even as the youngest competitor in his category, Diego stood out on stage with meticulous coaching by men's director Nikolai Kabaniaev. Congratulations to both of you, we are so proud of you! Congratulations to City Ballet School Alumnus, Julian Lacey, who has been promoted to Second Soloist at Semperoper Ballett in Dresden, Germany!! Julian also just premiered as Albrecht in David Dawson's Giselle - we are all very proud of you, Julian! Congratulations to City Ballet Alumna, Nastia Alexandrova, who has recently been promoted to the Corps de Ballet with American Ballet Theatre (ABT) in New York! We are so proud of you!